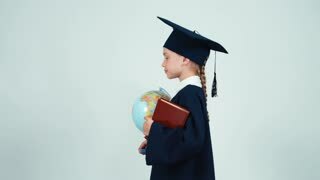 Camera follows happy excited little 5-7 years old girl walking along exotic tropical ocean beach wearing big straw hat. Camera follows happy beautiful little 5-7 year old girl in big straw hat running along atmospheric tropical ocean beach. 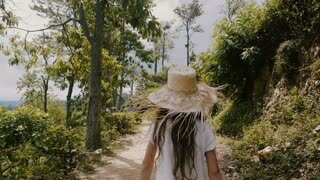 Camera follows happy little 5-7 years old girl child in big straw hat walk along sunny tropical forest road on vacation.